Joe Crevling and Vanessa Foster have only had their puppy Manny for a week but they are totally smitten. Manny is new to this world and while he's not a barker so far he has issues with ice cubes. 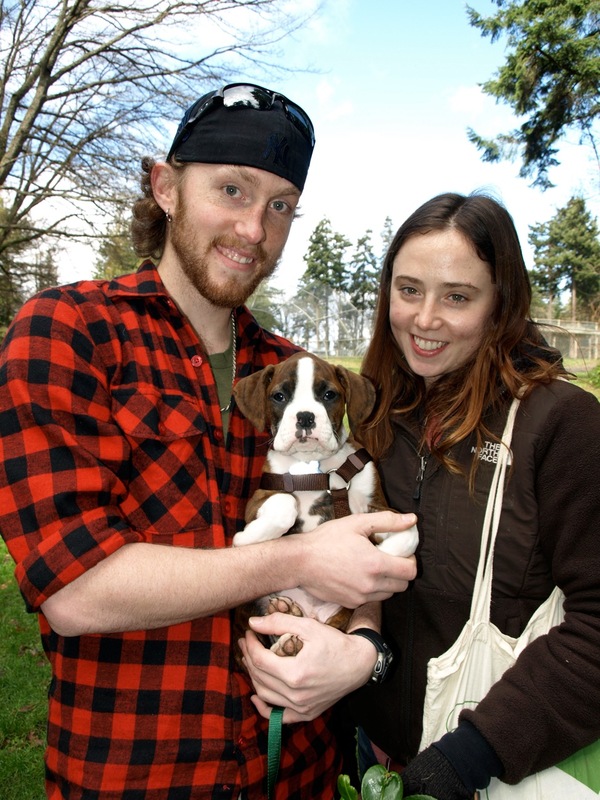 Joe Crevling and Vanessa Foster found their puppy Manny online through WashingtonBreeders.com which is a pure bred breeding website, based in Seattle. He's actually a rescue dog from Houston but for all parties involved, everything is new. Manny is only 10 weeks old and they have only had him for one week. He is named after the famous boxer Manny Pacquiao, former WBC lightweight world boxing champion. It's true what they say about puppies, that you fall in love with them instantly and Manny is no exception. "We love him to death," said Crevling. Even though their relationship with Manny is just getting started there are already things about him worth talking about. "Most dogs, will bark at the vacuum cleaner, but not Manny," said Crevling," he barks at the broom." Also at ten weeks Manny is not familiar with some things which results in a lot of absolute hilarity. "Last night we gave him his first ice cube (A cell phone video of that encounter is embedded below and we dare anyone to watch that and not laugh). He did not know what in the world was going on with that. He was barking and growling and getting down and licking it and running away again," Crevling said laughing. Manny is already the beneficiary of some careful puppy food research. Crevling and Foster went online and found Kirkland Signature Puppy Chow. They found that out of 150 different foods for puppies, that one rated literally at 110 (out of 100). It actually exceeded the ratings scale. Puppies can have "accidents" of course so Crevling said, "We are trying to get him 'crate trained' right now. So he learns to hold it and he knows we're coming back to him. He cries at night a little bit." "We leave him in the crate overnight," said Foster, " and we let him out every three hours because that's about how long he can last, but he's with us and all his toys." As part of his training he gets a piece of a "Beggin Strip" when he goes outside. "He's not a barker at all. We have dogs all around our neighborhood (...) and they bark a lot but he doesn't bark back. Manny has his toys of course including a sock monkey (his favorite), a lion with a frilly rope mane and all natural dog products. Want to nominate your pet for Pet of the Week? Stop by the VCA West Seattle Animal Hospital at 5261 California Ave. S.W. and just ask for a form. A nomination is not a guarantee of appearance and your name and photo may appear in our newspaper and online. Photos may or may not be used and our "Pet Reporter" may be in touch with you to arrange to take a photo. Pets nominated will be chosen on the basis of uniqueness of the pet and the quality of the story and information submitted.